Hey guys, it's me, Werfs. So, uh, funny story. I managed to sneak my way into Atmaz's house while he's at PAX. I'm gonna dig around and try to find some information regarding the next expansion for you guys. Until then, have this Faeria Friday. There's recently been a lot of discussion in the Faeria Discord regarding possible changes to some fundamental gameplay mechanics regarding both Constructed and Pandora. There are a few internal discussions currently being held regarding a few possible tweaks to current gameplay mechanics. While implementation may be far away, rest be assured that your voice is being heard, Abrakam is working towards finding ways to change things for the better. The current season will reset at 12:00pm CEST on Monday, April 1st, and will count for the Season of Ruunin. Just like Abrakam said, we'll be following along the Faeria lore through the next 5289 seasonal card backs. Lore Intensifies. The Top 8 FWC Point players will be invited to a Blitz format tournament that will be showcased live at PAX East over on Abrakam's official Twitch.tv channel. It will take place Saturday March 30th at 19:00 CET. As always, you can check the current FWC Rankings here. Eggs will be delivered all throughout the PAX East streams this weekend, and be hatching accordingly. Link your Faeria account to Twitch on The Hub to be eligible to win the following prizes. Faeria Exhibition Match: Team SOS vs Team Abrakam! 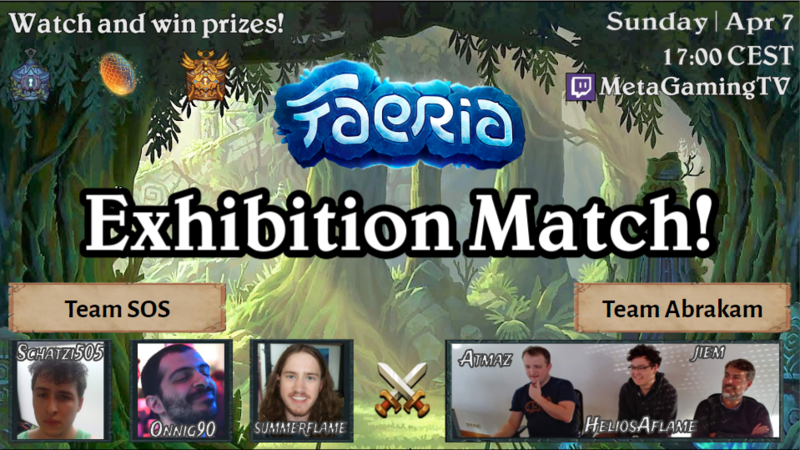 We are going to see yet another Faeria exhibition tournament! This time we will be seeing Team Abrakam take on well known streamers Onnig90 and Summerflame alongside a new name; Schatzi505. Described by ChiefBromden as "a crazy player with very weird but fun deck ideas", we'll only have to see what decks Team SOS will be bringing against Team Abrakam. As usual, ChiefBromden and Skorch13 will be your casters, hosting this exhibition tournament live over on MetaGamingTV's Twitch Channel. 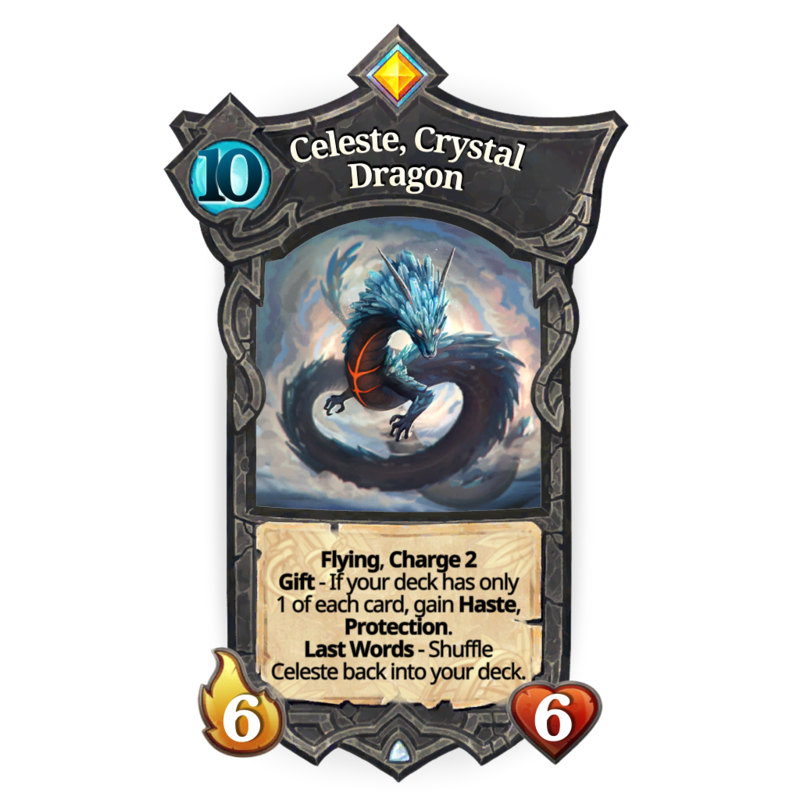 What do you think of Celeste? Overpowered? Underpowered? Pretty? Ugly? There's gotta be more stuff, take a look at the Decks of the Week while I try to find more information. You don't control me, matrien.